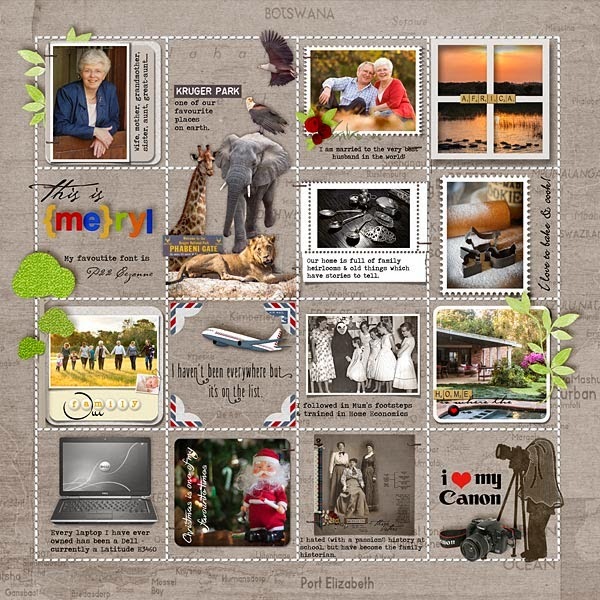 MyMemories Blog: Today's Daily Designer.....Meryl Bartho Designs! Today's Daily Designer.....Meryl Bartho Designs! Looking around now it is very hard to even imagine a time when digi-scrapping stores did not exist – believe it or not, there was just such a time, & at the risk of really aging myself, I will admit that I was around at just such a time and digi-scrapping all the same. It was back in 2002, after our eldest daughter’s wedding that for me the whole wonderful digital scrapbooking process began. The professional photographer produced a beautiful album, but I remember thinking – there is more to it than this, what about the story of our searching out the perfect dress, exactly the right venue for the reception, the kitchen tea, all so much part of the story. I pondered it for a while, and coincidentally a friend came back from a holiday in Australia with paper scrapbooking supplies and pages she had made of her trip. I knew right away that this was exactly what I had been imagining! It was not long that reality hit though – first she had bought all that in Australia, there were no supplies in South Africa at that time, and I quickly realized that being the kind of person that I am it would NOT have taken long to have all the bits and bobs involved with paper scrapbooking, all over the house – there had to be an easier way! I started Googling scrapbooking and for some reason must have added “digital” to my search and then I found there were folk out there doing exactly what I had in my head – putting pages together without all the mess and clutter! From then on I was determined…… I pestered dh about Photoshop (about which I had NO clue! And in fact I was decidedly computer illiterate!) and he got me a copy of Photoshop 6, really to keep me quiet, being quite sure that it would all “blow over” but I was now on a mission to learn all I could – I worked through any and every tutorial I could find until at least I could open a blank document and add photos….. Those early pages were very, very basic – flood filled backgrounds (oh the excitement when I found I could add texture with the texturizing filter!) and clip art embellishments, but my joy had no bounds! I discovered a teeny, tiny site where we shared our pages, all creating from scratch any and everything we needed for our pages. Fast track to 2004 – I was asked to be a moderator on the “soon to be opened” digitalscrapbookplace.com, and then later that year invited to be a designer. What a wonderful journey it has been to date! Sadly digitalscrapbookplace has just been closed, but the next exciting part of the journey has just begun with making my home at My Memories! I love designing, and love creating scrapbooks for the family – what a joy it is to see them pouring over the pages being reminded of times happy and sad. One of my goals has been to create an album of our family history – this I am happy to say is almost complete! Be sure to shop Meryl Bartho Designs today and enjoy 40% OFF!